No-churn ice cream has gained widespread popularity, and for good reason. Not only is incredibly easy to make, it tastes so rich and luxurious. 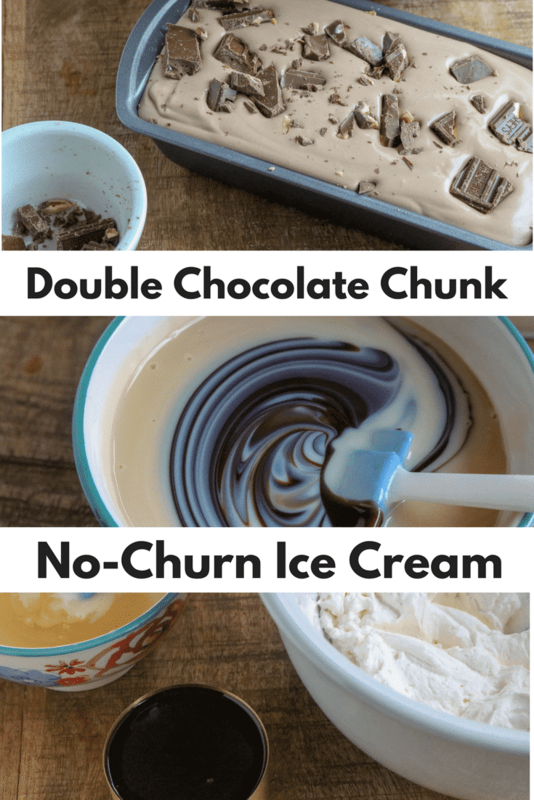 When your ice cream craving strikes, why not skip the trip to the local market or neighborhood ice cream shop and whip up a batch of no-churn ice cream yourself? 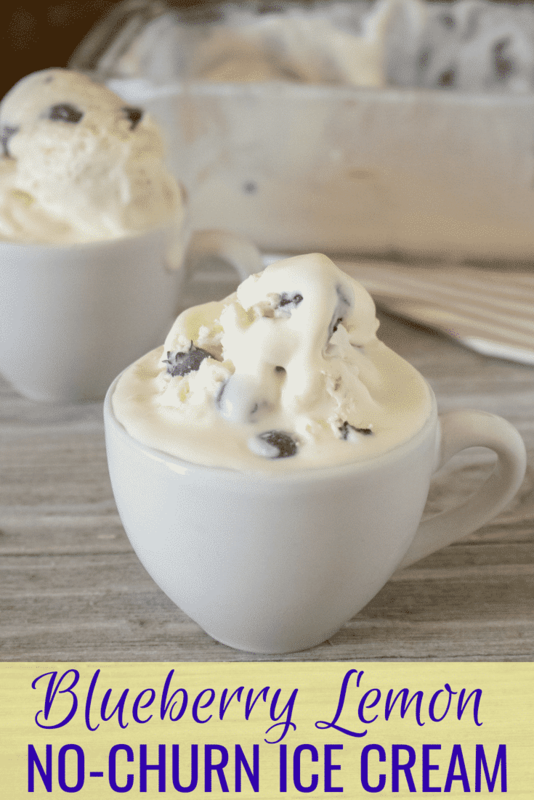 All that’s required is 3 simple ingredients — heavy cream, sweetened condensed milk, vanilla extract — and a basic hand-held mixer or stand mixer (even a balloon whisk and a little elbow grease will work) to make an ice cream base that is decadently rich and creamy. No special equipment needed! Plus, it’s endlessly customizable. Once you make the base, you’re free to add any type of mix-ins and flavorings you like. Candy, cookies, fresh fruits, coffee, pie fillings, even your favorite breakfast cereal…there truly is no limit! 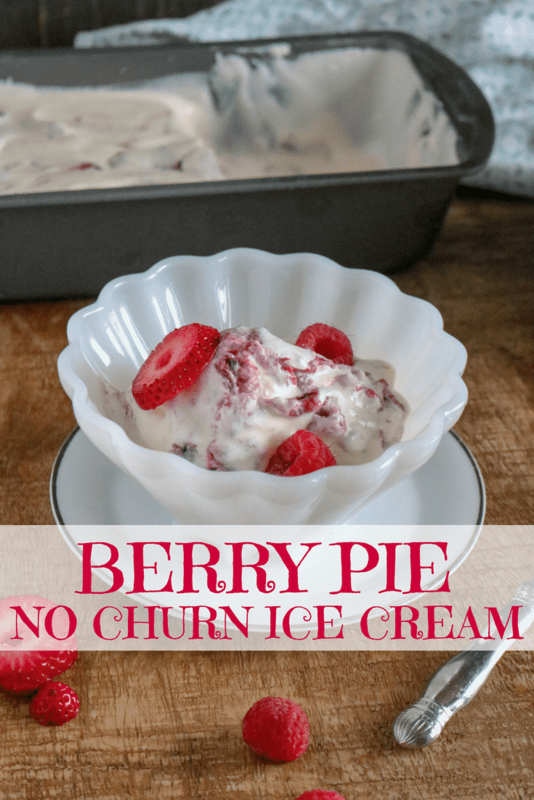 Berry Pie No-Churn Ice Cream takes a classic pie and mixes it together with ice cream. Once frozen, this combination creates a flavor that is ice cream perfection. Double Chocolate Chunk No-Churn Ice Cream mixes together homemade chocolate ice cream and chunks of chocolate, which is perfect dessert for a chocoholic. 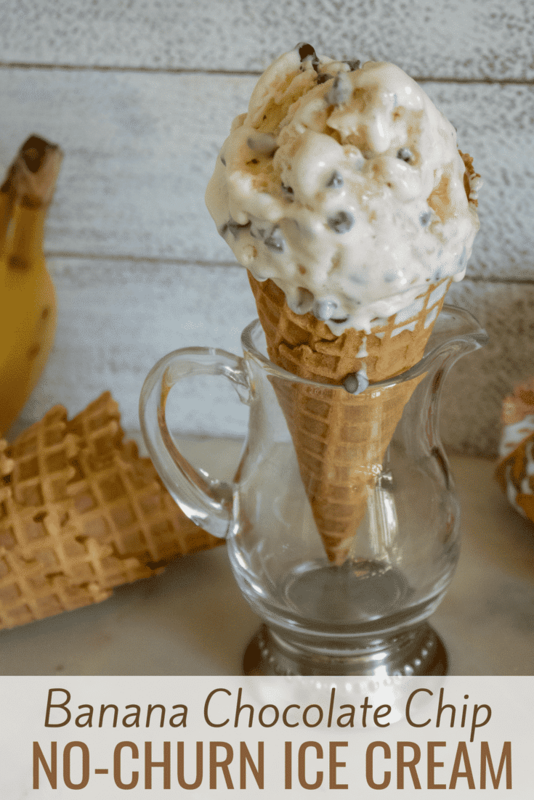 Banana Chocolate Chip No-Churn Ice Cream makes us think of banana bread ingredients in an ice cream cone. Who wouldn’t like that combo? 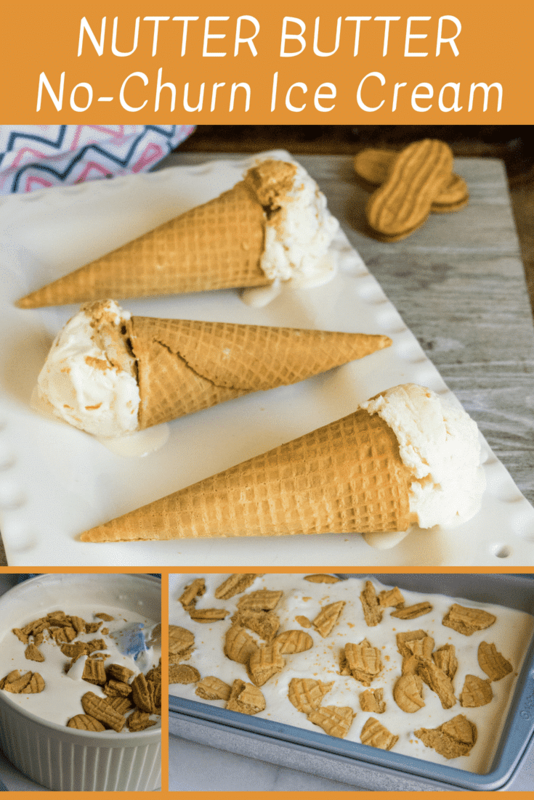 No-Churn Salted Caramel Pecan Ice Cream is a classic ice cream recipe and a flavor that is all the rage these days. Lemonade No-Churn Ice Cream is an absolutely refreshing ice cream that makes us think of savoring lemon gelato in Italy. Strawberry No-Churn Ice Cream is so full of fresh strawberry flavors that we literally couldn’t get enough of it. It’s SO delicious. Bubble Gum No-Churn Ice Cream uses bubble gum flavoring as the flavoring and of course we had to add in some colorful gumballs. 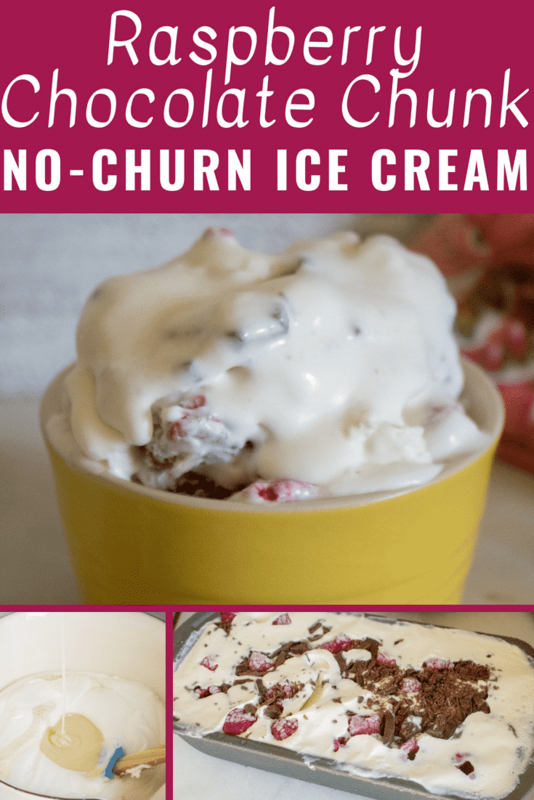 Black Cherry & White Chocolate No-Churn Ice Cream is a fun mixture of white chocolate and delicious fresh cherry flavors. This homemade ice cream makes you wonder why you haven’t been making ice cream from scratch all along. 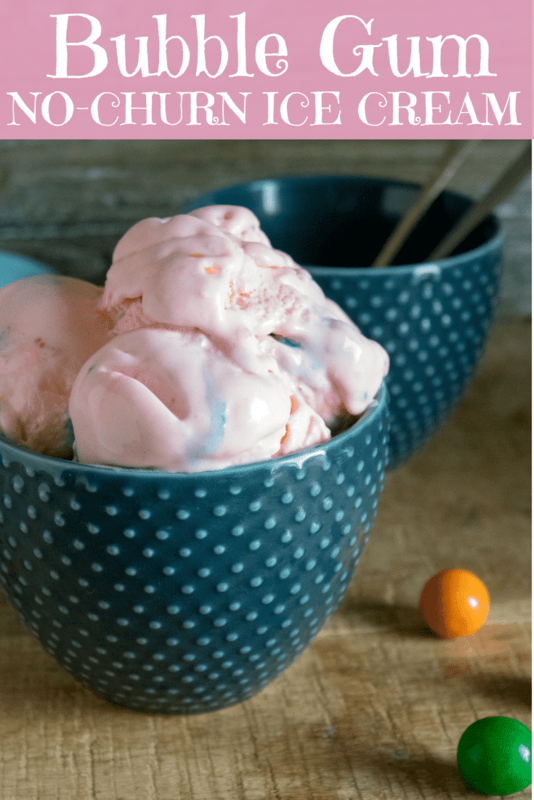 No-Churn Blue Moon Ice Cream is a fruity-flavored classic ice cream recipe that is even more fun to whip up at home. 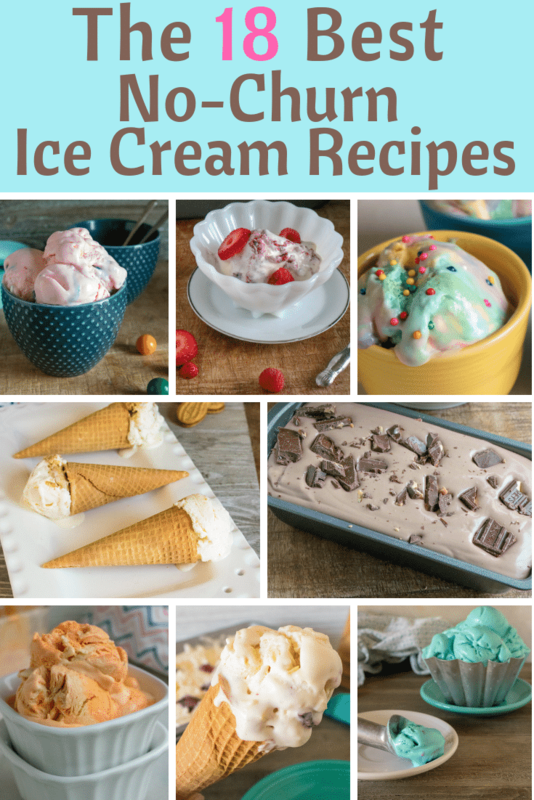 Imagine making this ice cream the next time you’re looking for a summer dessert recipe! Blueberry Lemon No-Churn Ice Cream is a refreshing ice cream full of light lemon and blueberry flavors. 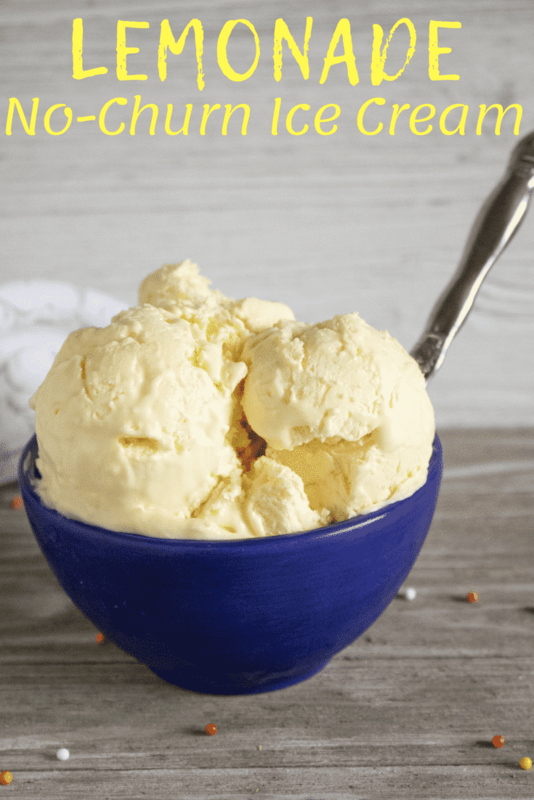 Orange Creamsicle No-Churn Ice Cream is absolutely amazing. 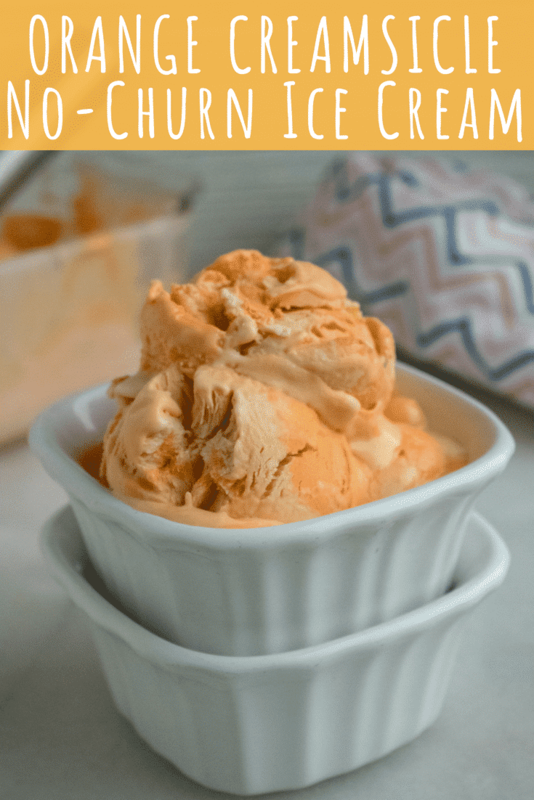 If you love that classic Orange Creamsicle flavor, you will love this easy homemade ice cream recipe. 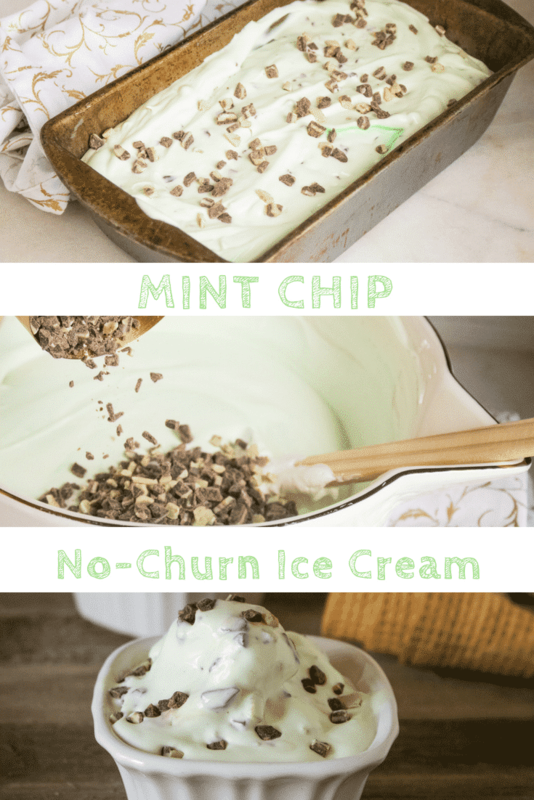 Mint Chip No-Churn Easy Homemade Ice Cream is amazing. 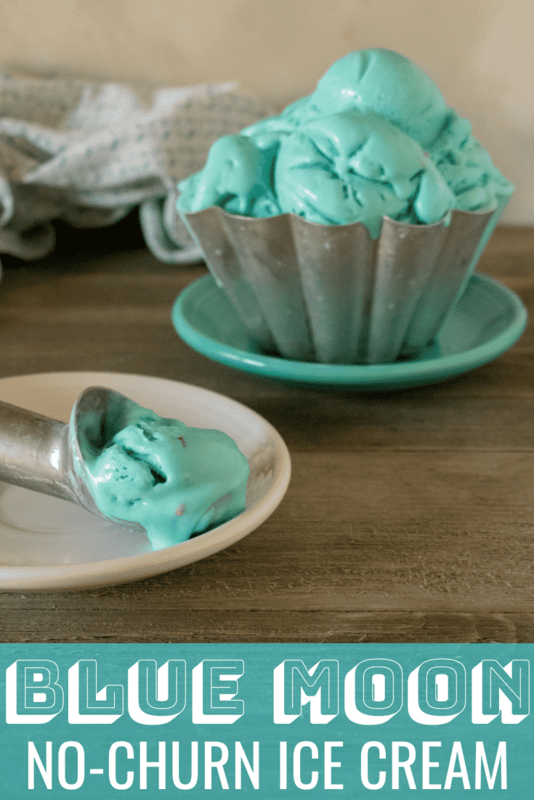 Mint Chip ice cream has always been one of my favorite ice cream flavors, and this homemade copycat ice cream is so good! 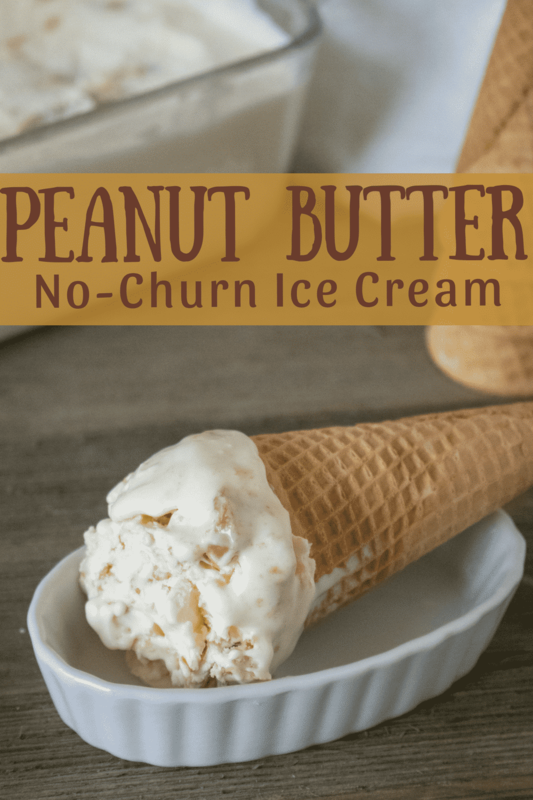 No Churn Peanut Butter Ice Cream is full of creamy peanut butter goodness. 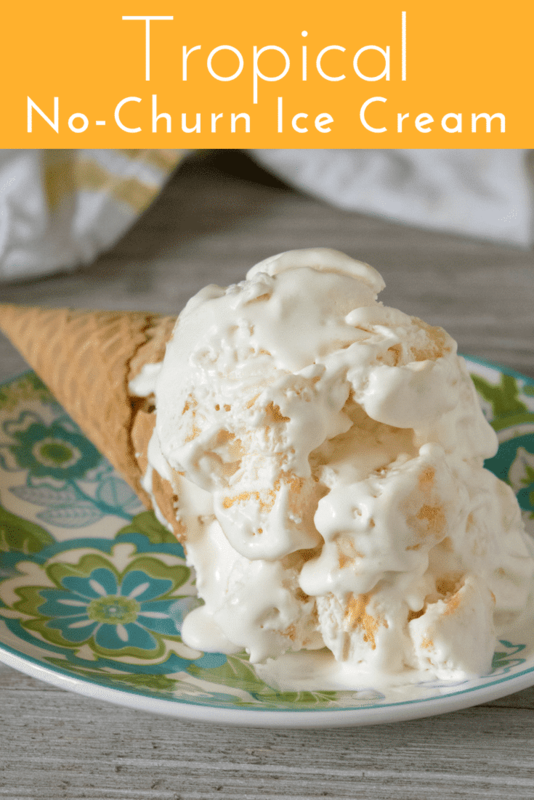 If you like Peanut Butter ice cream, you’ll love this homemade Peanut Butter Ice Cream recipe. Raspberry Chocolate Chunk No-Churn Ice Cream uses fresh raspberries and chunks of chocolate candy bar to sweeten up this delicious homemade ice cream. You’re going to love it! What’s better than cookies and ice cream? We certainly can’t think of much. Nutter Butter cookies mixed together with our delicious no-churn ice cream make this a tasty ice cream recipe. 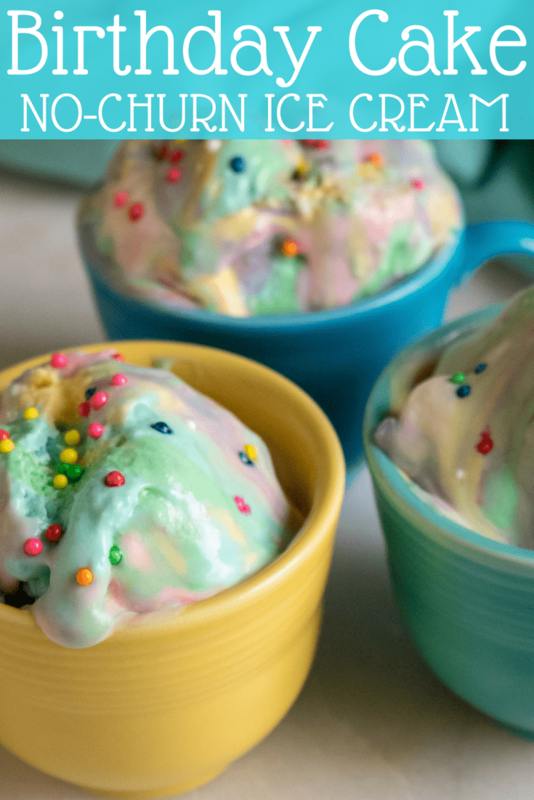 Birthday Cake is a staple during most birthday parties, but why not mix up this yummy homemade no-churn birthday cake ice cream for your next birthday party dessert recipe? It’s a fun and festive addition to the birthday party menu and is a sweet treat that everyone will love. Tropical No Churn Ice Cream is full of fresh tropical fruit flavor. This healthier-for-you no churn ice cream pops in a nice serving of fruit along with your sweet ice cream recipe. This recipe is so tasty. 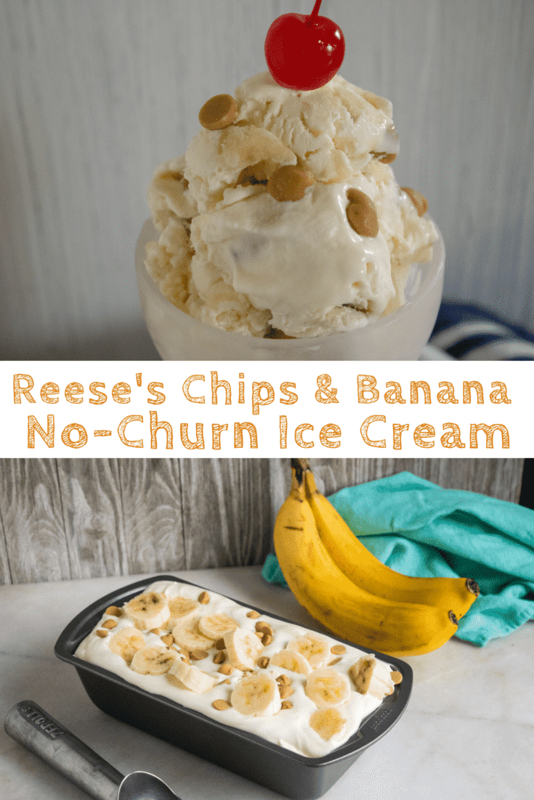 Think chunks of bananas and Reese’s chips. Put a cherry on top and call it a homemade no churn ice cream sundae.